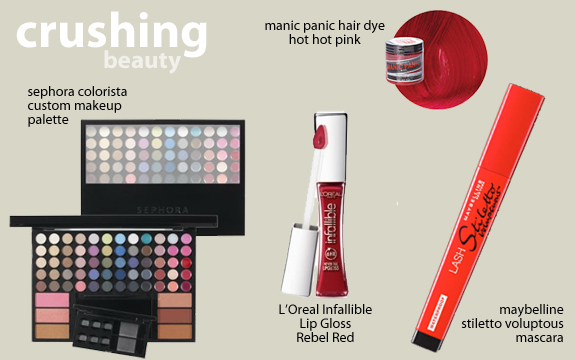 I’m crushin on some beauty products right now. I don’t have much of a beauty routine. It’s more that I just like to play around in makeup. I’ve been afraid of makeup for so long, mainly in the application of eyeshadows and eyeliners but the more I practice, the more comfortable I’m getting. Plus, I’ve gone without makeup for most of my life so if I do wear it, all of a sudden it’s obvious. I’m slowly starting to incorporate a natural makeup routine into my lifestyle. But let’s have a look at some of the fun stuff that I’m currently lovin’! This was $19!!! For someone who is new to makeup and experimenting with colors, this is ideal! 44 eyeshadows, 5 eyeliner options, 15 different lip glosses, 4 blush and 2 bronzer palettes! Yowza. And it comes with a travel size palette that you allows you to mix and match different colors. So far I’ve played with the different shades and they last pretty well throughout the day. Just like McDonald’s, I’m Lovin It! I really wanted something red. I really would like to go for a pinup red but I’m just not that comfortable sporting that right now. I love the way this stains my lips like I just had a red popsicle! It lasts a good portion of the day and application is easy. Glides on nicely too. I have a horrible habit of biting my lips so when I’m not wearing anything, I keep my lips hydrated throughout the day with a small tube of Vaseline Lip Therapy. It’s made a huge difference. Reminds me I lost it on Monday so I’ll buy a fourth one next time I’m in the grocery. Mascara is a staple. I always put some on even if I don’t do much else. And mascara can be hit or miss. I read reviews and they are always about 50/50 when it comes to success. I work for an animation studio and when this new Lash Stiletto Mascara unveiled, our studio created a web game for it. I didn’t work on it, but I do remember how much fun the branding for it was. A year and some change later and I finally purchased it. To me, great packaging is a good enough gimmick for me to buy into it! It is fabulous though. It doesn’t give me the spider eyes and it doesn’t really feel like I’m wearing anything. BONUS! Manic Panic Hair Dye in Hot Hot Pink! Okay! How does this fit? Wasn’t I supposed to be creating the wardrobe of a French sophisticated woman? I know Anna Karina never sported hot pink hair, but this is something I’ve dreamed of for years. 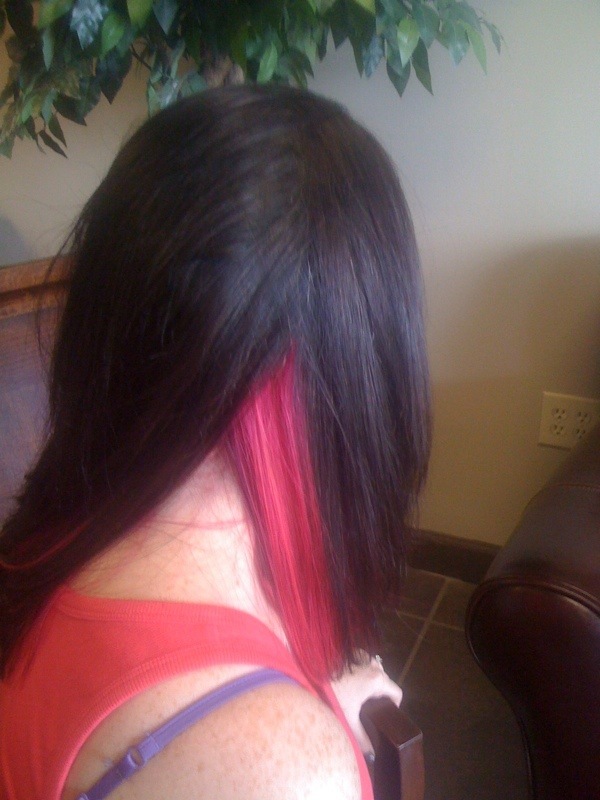 I finally went to a friend who is a stylist and begged for some hot pink hair and of course she obliged. I have dark dark brown hair! So the bleaching process took a really long time. And I didn’t do my whole head! Just underneath. In fact, I loved it so much, last night I had my husband do some more of it. Yes, we are crazy and the process deserves its own posting. I have to say, the at home bleaching process wasn’t as strong as the salon process but I still got great results. Check out the salon dyed pic! The latest pic isn’t up due to the fact that it was almost midnight when we finished and I really wanted to go to sleep!